Nail art instead of swatches tonight. But I'll be back to swatches tomorrow. then apply it on top of some tacky polish on your nail. I stamped with Winstonia plate W111 in black. I used my custom Paws polish clover green and added white to get the four shades. I just mixed the colours on a palette and used a nail art brush to fill in the stamp I did a gradient using the same Paws clover green and white and applied Penelope Luz Dark Angel black glitter over the top. I loved how the whole design came together. 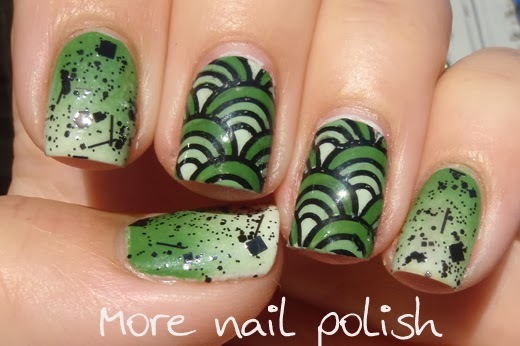 Did you notice that I totally cheated on my right hand and just stamped the black directly onto the green polish. It just doesn't have the same depth or interest does it! Super pretty, you're right about the lack of depth with the black stamping only! 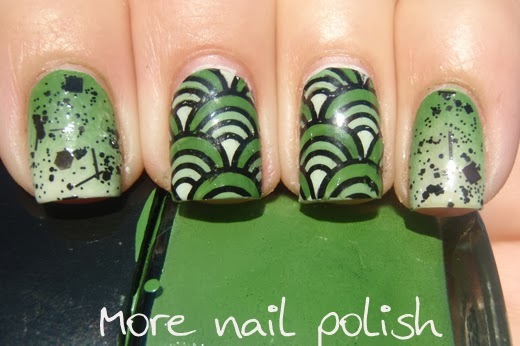 I really need to try the reverse stamping, it looks fantastic! Love this look! I need to give it a go! So pretty, I love it! 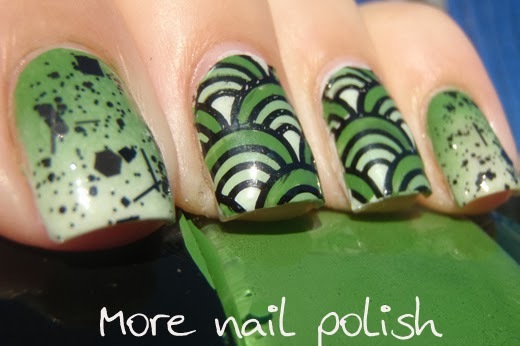 I'll have to try this technique soon, I still haven't quite mastered the art of stamping right on the nail, and my perfectionist side can't handle the flubs. Looks like this would be the better solution! OMG so cool! I love it! So unique and beautiful! Did you just start with a white base coat under the stamp?